Fitness bands and trackers are everywhere these days. Some have AMOLED screens, others still use layers of LED lights to give you basic info, and a handful lack interfaces altogether, instead relying on companion apps to do the dirty work. For the most part, none of that really differentiates one from the other because all pretty much do the same thing – they log hours of fitness info and expect you to figure the rest out on your own. What if a smart band or fitness tracker could not only log your workouts, but also instruct you on how to get better at them? What if you could improve your running form or swimming stroke or golf swing by wearing a tracker on your leg, arm, or body? A new product called Moov aims to do exactly that. Moov, created by an Apple engineer and two sensor research guys from Microsoft, is a fitness tracker filled with sensors that aren’t uncommon to other wearables, but Moov is trying to do so much more. Using 3D motion sensing and a voice assistant, Moov will track something like your cadence and then tell you how to adjust so that you can run longer. Or it could track impact, to help you run softer and avoid injury. 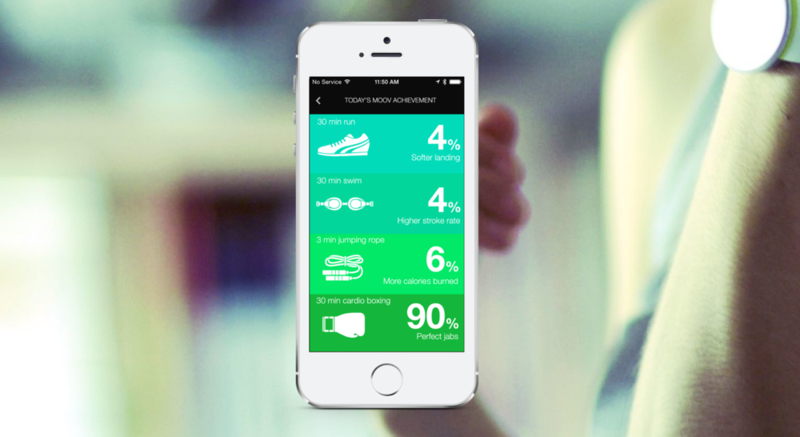 Running isn’t everything, though, so Moov will do swim, cycling, and regular workout tracking as well. Later on down the road, it aims to add on golf swing and yoga coaching. Yes, Moov wants to teach you how to play golf better. Moov is a sensor attached to a band that can be warn on your wrist, arm, leg, or even mounted to things like your bike pedal. It pairs with smartphone apps to track your progress in real-time, while also providing feedback. For now, it’s an iOS deal, but within the first four months after launch, its creators hope to have it on Android as well. The company has launched a crowd-funded campaign of sorts through a stand-alone website. Their goal is to reach about $40,000 in funding with an initial launch of summer 2014. If you get in on the early campaign pre-order, you can grab a Moov for $59.95. That’s half off of the expected retail price of $120.